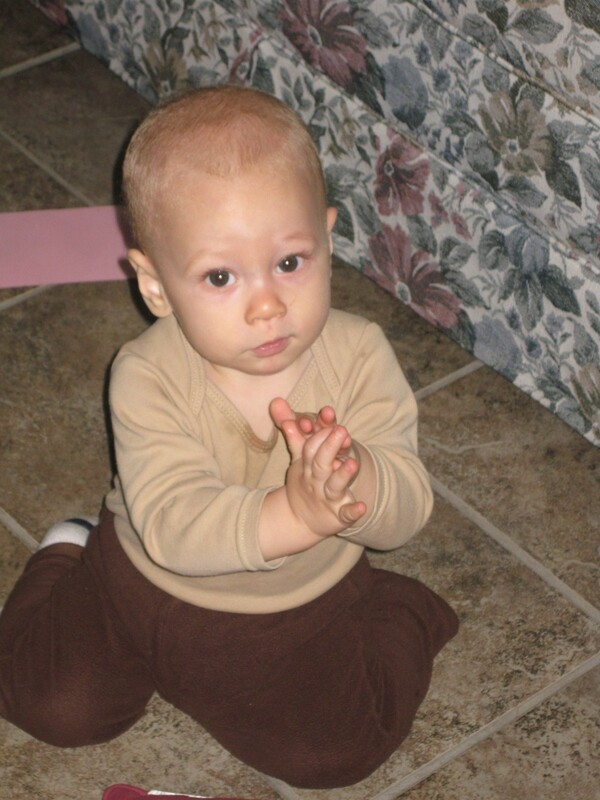 I cannot think of many things more precious than a child, bowed down, hands clasped in prayer. I love to listen to Joseph praying because his prayers are so sincere, so heartfelt, so spontaneous. He’s never rushed or distracted, like I find myself sometimes. His heart rejoices and he finds peace in his prayers. Oh, how I could learn from him! I’ve been praying with and for Joseph and William since they were in the womb (and even before as I prayed for the gift of life). While I was pregnant, I did what many faithful Catholics would do: I went to daily Mass and I prayed, often. I prayed the rosary, the chaplet of divine mercy, and with William, I prayed using Donna Marie Cooper O’Boyle’s Prayerfully Expecting. Then upon arrival, I prayed many prayers of thanksgiving for the precious gift God had entrusted to Dax and me. 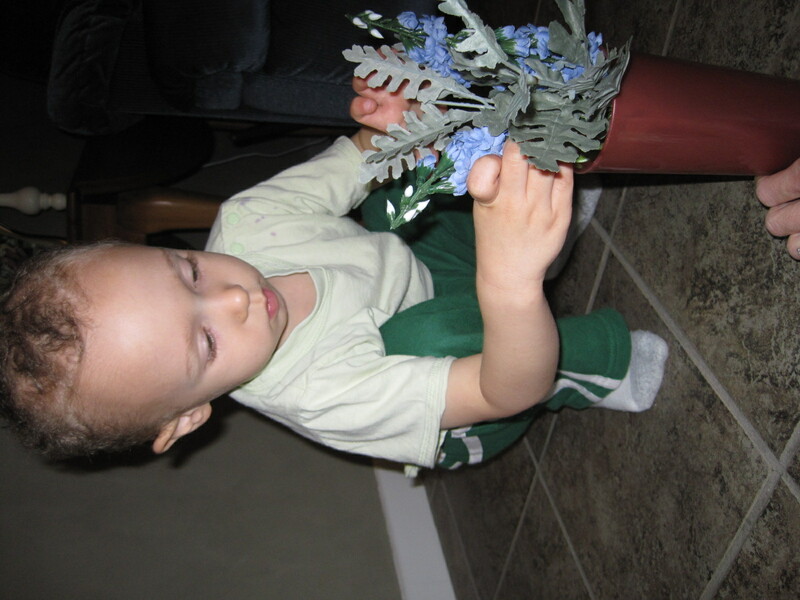 While they were little and nursing, I continued praying. I sang the Hail Mary to fussy babies and offered spontaneous prayers of petition for grace in my mothering journey. I didn’t do it perfectly…in fact some days, I’d get caught up in the midst of mothering and find myself falling asleep as I prayed for my children, but no matter what I did or to what extent, I did it with a heart of faith. Then as Joseph began to get a little older (before William came along), I realized that not only did I need to pray (and pray often! ), I needed to find a way to pass on my faith and the rich culture of the Catholic Church to my children. 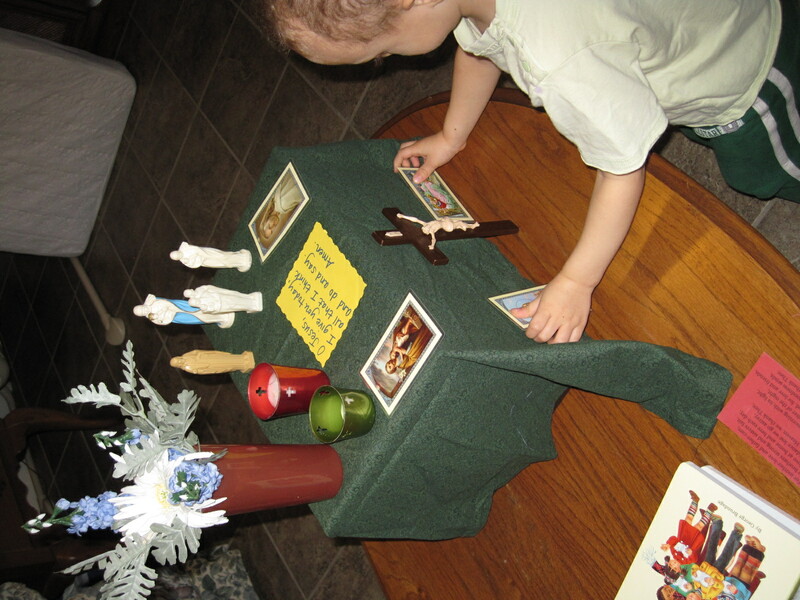 How do you put your faith into something tangible to present to little ones? 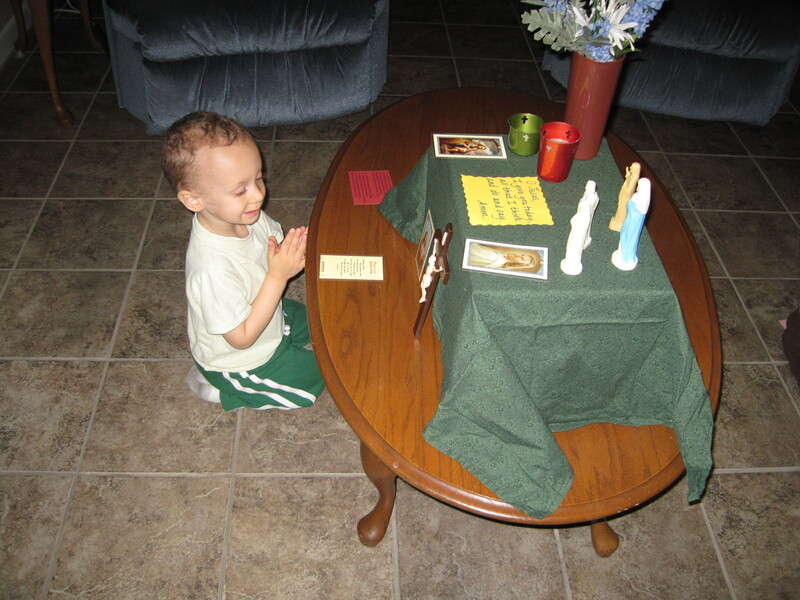 How do you teach children to pray? I wasn’t really sure, so I started out by taking Joseph to daily Mass and I prayed the rosary with him while I put him down for a nap. But it still didn’t feel like that was enough. I wanted Joseph to fall in love with the God that I know…a God who is merciful and full of love. I wanted Joseph’s heart to turn to prayer throughout the day…when he was happy; when he was sad; when he just was. So I did what I always do. I began to read and question. I read The Catholic Home by Meredith Gould and The Religious Potential of the Child by Sofia Cavalletti. I read Guiding your Catholic Preschooler by Kathy Pierce and Lori Rowland. I read blogs of beautiful Catholic moms who had traveled the road on which I found myself. I called friends from my parish that I admired and asked how they did it. And then, equipped with many bits of brilliance, I began to formulate a plan. What a wonderful treasure chest our Jesus box has become. 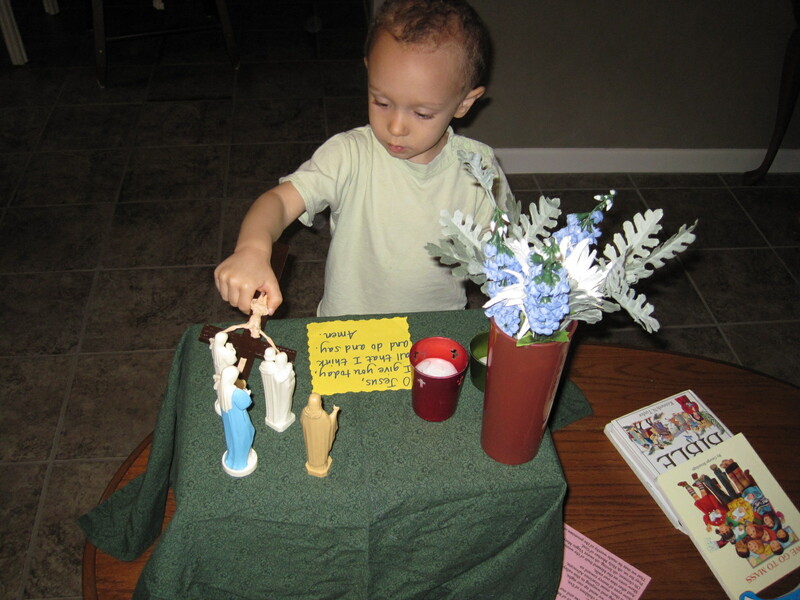 You’ll always find the basics in our box: candles; prayer cards; flowers; altar cloths; statues of Jesus, Mary, the saints; a crucifix; a children’s Bible. But take a peek throughout the year and you’ll find other treasures. During Advent, we put in an advent calendar and delightful Christmas stories. 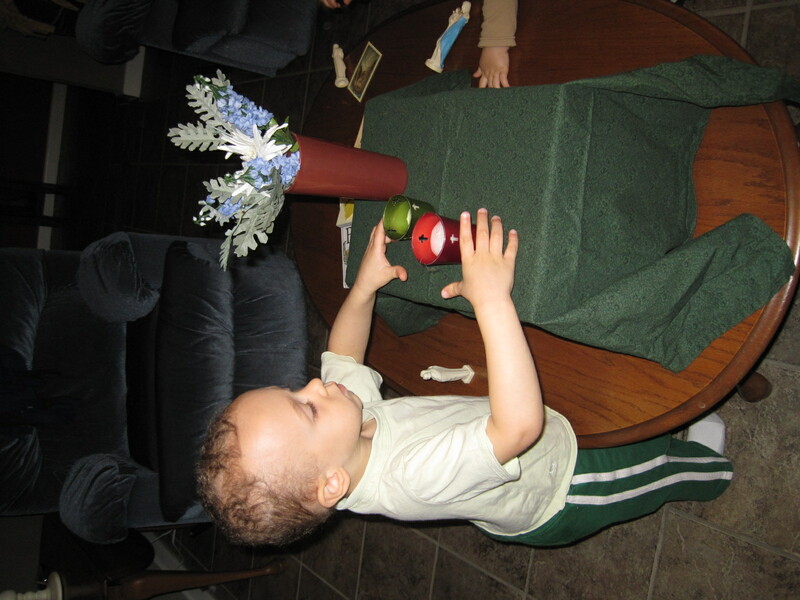 We add a cloth advent wreath with cloth candles and a clever Advent prayer cube. During Lent we add the story we use with our resurrection eggs (of course the eggs don’t come out until Easter!) and an illustrated guide of the Stations of the Cross. Also, we keep our rosary nearby for praying the Sorrowful mysteries. Ordinary Time allows us the opportunity to learn about the saints…how to pray with them and how to ask for special intercessions. Each day our experience with the Jesus box is different. Some days we pray a decade of the rosary; some days we pray spontaneously; some days we just set the altar and gaze lovingly upon our Savior. Each day might be something new, but each day is always beautiful. 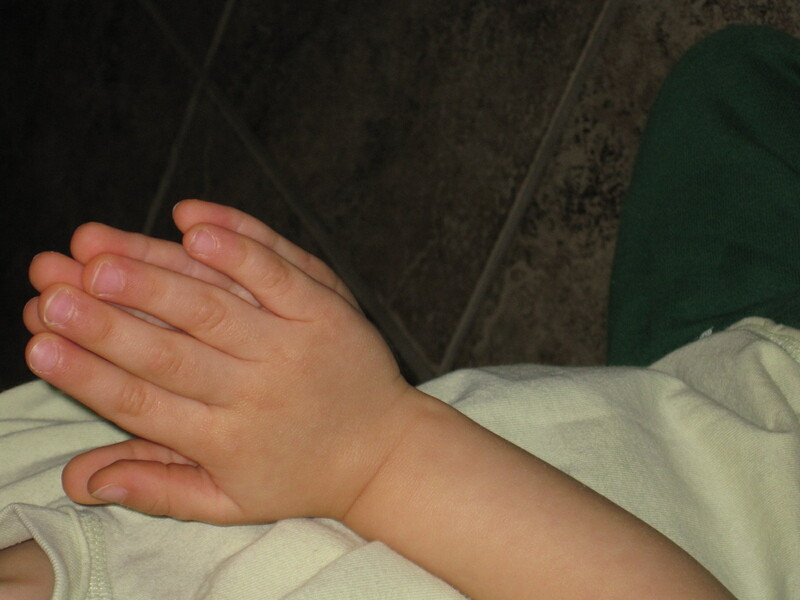 I love the little prayer hands of both boys. What a sweet story for the beginnings of the Jesus box and it’s development. You are very special and a very spaecial mom. Your sons are very blessed to have you as their mom.